Galganov's Easy Recipe for Baba Ganoush! Preheat the oven to 325o f (160o c). Pierce the skin of the aubergine and cook it over the flame of a gas stove-top, on a bar-b-que or under the broiler of an oven - turning it frequently - until the skin is browned. Brush the skin with oil, place it on a baking sheet and bake it in a hot oven for about 30 to 40 minutes - until the eggplant is easily pierced with a paring knive - and the knife is released. Cut open the eggplant and scoop the soft flesh out - into the mixing bowl. 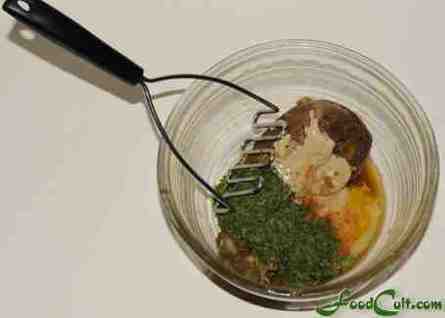 With the potato masher, crush the mixture until it is blended and smooth. Refrigerate for at least an hour to give the ingredient flavours a chance to come together. Some will use a food processor to assemble the ingredients - it certainly can be done quickly. We generally use a potato masher. A food processor will, though, yield a smoother consistency. Using too little of any flavouring is okay! You can always add more salt, or lemon, or garlic, or anything after blending. There are so many ways to spell Baba Ghanoush. Alternates include but are not limited to baba ganush, baba ghannou, and baba ghannoug. Popularized and now the most common accepted spelling (although traditionally a misspelling is "baba ganoush". There are more ways to prepare this dish than there are to spell it so, there's no right or wrong way - there's only the way you like it. No matter how you spell it though, this aubergine eggplant dip is a winner at your dinner table or at a party. The next challenge with baba ganoush is that since the eggplant itself cannot be effectively sized, you will have to learn to adjust ingredients to fit the volume of eggplant. This recipe is based on an aubergine of approximately 500 g (1 Lb) raw. Add your ingredients and then taste the mixture adjusting volumes as needed. We like it a little creamier and, so, add more tahini than some recipes call for. Some use cilantro instead of parsley. Some add mint (very common in some regions). Try, taste and learn what you like best! We like a blananced flavour where you can just taste everything ... but no single ingredient is overwhelming. Of course, a nice, home made baba ghanoush is best served with home made pita.